You never know when you’re going to find yourself in an emergency. These life-changing events don’t announce that they’re coming. It’s just boom – all of a sudden, they hit. But you do have the ability to prepare for how to respond when one occurs. When it comes to your mouth, your emergency dentist in Aurora says you should be sure about what classifies as an emergent situation and what to do when it happens. Read on to learn how you can protect yourself. Knocked Out Tooth – If you suddenly have a tooth dislodged due to trauma to your mouth, your first step should be to rinse the tooth thoroughly with water and then carefully place it back in your mouth. Then, hold it there until you can be seen by your dentist. Broken Tooth – Again, the first step is to rinse the tooth. If there is any bleeding, you can gently bite down on a cotton gauze to help stop it. Also, if there is any swelling, you can apply a cold compress to your jaw. 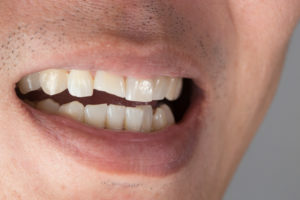 Damaged or Dislodged Temporary Crown – If your temporary crown is some how damaged or falls out of your mouth, you can reattach it with a small dab of toothpaste, dental wax or temporary adhesive. Severe Toothache – In the case of a severe toothache, rinse your mouth with warm water and floss around the affected tooth. This is also a way of gently probing to make sure there is nothing lodged in the gums surrounding the effected tooth. Cut/Bitten Lip or Broken Jaw – If you are experiencing serious blood loss or suspect that you have a broken jaw, you need to visit the emergency room immediately. In some cases, dental emergencies can be avoided. For example, if you or your child are planning to be involved in any event that could result in physical contact, it’s best to wear a custom mouthguard to protect you from sudden collisions that could cause broken or dislodged teeth, a broken jaw or laceration. Furthermore, if you have an existing issue with tooth decay, taking a proactive approach and visiting your dentist will prevent the problem from getting to the point where you have a severe toothache. But, if you find yourself in an unavoidable dental emergency, don’t panic because you’re now prepared to stabilize the situation on your end, until you can be seen by your dentist in Aurora. Dr. Matt Mauck received his undergraduate degree from LSU and then went on to earn his Doctor of Dental Surgery degree from the University of Colorado School of Dental Medicine. He is a member of the American Dental Association and several other professional organizations. Dr. Mauck practices at D’Amico and Mauck and can be reached for more information through his website.